Two groups of top travel agents from across the US visited Co Laois over the weekend, as guests of Tourism Ireland and Fáilte Ireland, in conjunction with American Airlines and Aer Lingus. The agents – all representatives of top-producing American travel companies like Ensemble, Virtuoso, Signature Vacations and American Express – were here on a fact-finding trip to Ireland, prior to attending a B2B workshop with over 120 tourism providers from across the island in Kilkenny, where they heard about the exciting programme of events which is in the pipeline for ‘The Gathering Ireland 2013’. As well as directly targeting the Diaspora and those with a connection to Ireland right around the US, Tourism Ireland is also working closely with influential travel agents, so that they will encourage their clients to come here next year to enjoy the festivals and events of ‘The Gathering’. American travel agents with Virginia Goff, Tourism Ireland New York (front row, third from left),outside Castle Durrow Country House Hotel during their recent visit to Laois. Their itineraries included a visit to the gardens at Emo Court, as well as dinner and an overnight stay at Castle Durrow. 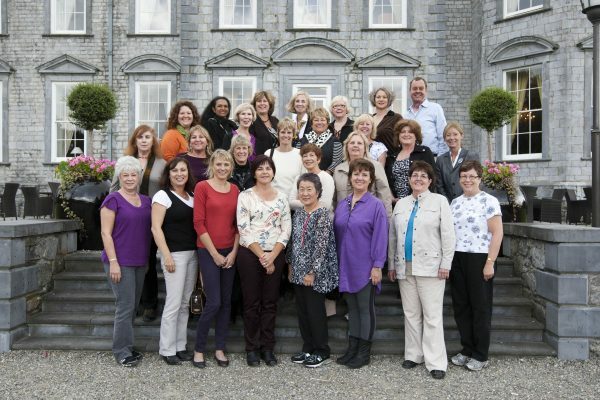 Alison Metcalfe, Tourism Ireland’s Vice-President of Marketing in the United States, said: “We are delighted that so many of these influential travel agents took the time out of their busy schedules to come and visit Co Laois and Ireland. Familiarisation visits such as these are extremely important as the travel agents get to experience at first-hand the wealth of things to see and do here for American holidaymakers. Our aim is that when they return to the US they are better equipped to advise their clients about Ireland when planning and booking their holidays.